Another European country - Luxembourg - has signed an accord with China on the Belt and Road Initiative (BRI) following Italy, and more EU countries will join in the framework and benefit from future development opportunities, Chinese experts and EU officials told the Global Times on Thursday. Luxembourg Prime Minister Xavier Bettel signed an agreement with China on Wednesday to cooperate on the BRI when meeting Chinese Premier Li Keqiang at the Boao Forum for Asia, which runs from Tuesday to Friday, the Xinhua News Agency reported Thursday. A memorandum of understanding on jointly building the BRI and financial cooperation documents were signed on Wednesday. 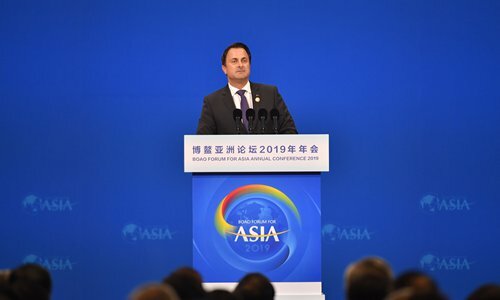 Bettel said Luxembourg firmly supported the China-EU comprehensive strategic partnership and the construction of the BRI, and it hoped to enhance mutually beneficial cooperation with China, according to Xinhua. Li said China is ready to work with Luxembourg to expand two-way opening-up and deepen pragmatic cooperation, particularly financial cooperation. China's Shenzhen Stock Exchange is building a central information hub with the Luxembourg Stock Exchange to allow investors to access green bonds traded in China on a single platform, bolstering the international influence of the green fixed-income instruments traded on the Shenzhen bourse, according to its official website on Wednesday. "President Xi Jinping's state visit to Italy has indicated a direction for China-Italy relations in the new era," said Gao Feng, spokesperson of China's Ministry of Commerce, during a press briefing on Thursday. Chinese and Italian enterprises have signed 10 commercial deals in such sectors as infrastructure and equipment and the two nations will also develop cooperation in third-party markets to boost further economic exchanges and trade, said Gao. Italy will attend the second China International Import Expo to be held later this year, said Gao, adding the Chinese market will be open to Italy where many good companies exist especially small- and micro-sized ones that provide high-quality goods and services. "There will be more European countries joining the BRI," Michele Geraci, undersecretary of state with Italy's Ministry of Economic Development, told the Global Times on Thursday. Geraci was in charge of helping Italy join BRI. Chen Xin, research fellow at the Institute of European Studies at the Chinese Academy of Social Sciences, told the Global Times on Thursday that the BRI differentiates itself from other plans in the way that it is open, inclusive and development-focused. "It is important to note that this is an initiative that primarily aims at development for all countries involved," Chen said. "It is not a political plan, nor a plan for taking sides. It embraces all countries that are willing to join and is happy to provide development opportunities." Due to its focus on development and the opportunities it brings, the BRI was already popular with Central European and East European countries, said Chen, adding that more developed countries like Italy and Luxemburg could persuade other countries that are still hesitating. "Participation of countries like Italy can boost the confidence of other countries in southern and western Europe and encourage them to join the BRI," Chen said. "Much like participation in the Asian Infrastructure Investment Bank, countries tend to follow suit after one takes the initiative." The BRI also means big potential opportunities for countries in Europe in multiple areas, Chen said. "While European countries have comparative advantages in many sectors, many are now facing emerging problems in terms of their infrastructure and manufacturing industries," Chen said. In Italy, for example, China can provide experience from its rapid infrastructure development, where there is strong demand, according to Chen. Liu Jianying, an analyst from the Ministry of Commerce, told the Global Times that for Europe, the BRI can mean more opportunities and development for local economies. "It can connect local economic development in Europe with other markets along the BRI route, and exchange resources, knowledge and technologies among different markets. For Europe, that also means huge market potential for its economies," Liu said.